In this today’s article we will talk about how to Dropship without Shopify. Dropshipping is one of the most successful business models these days. A lot of people create their Dropshipping stores through Shopify and Oberlo app. Shopify is one of the easiest ways to establish your online store as it offers an amazing software. We have tested the 14-day Shopify free trial and it proved to be good. Oberlo app is also very convenient to use. It enables you to import products from AliExpress directly into your Shopify store. Both Shopify and Oberlo are very user-friendly. However, some people may want an alternative of these platforms to establish Dropshipping business. WordPress can be one of the best alternatives to this. 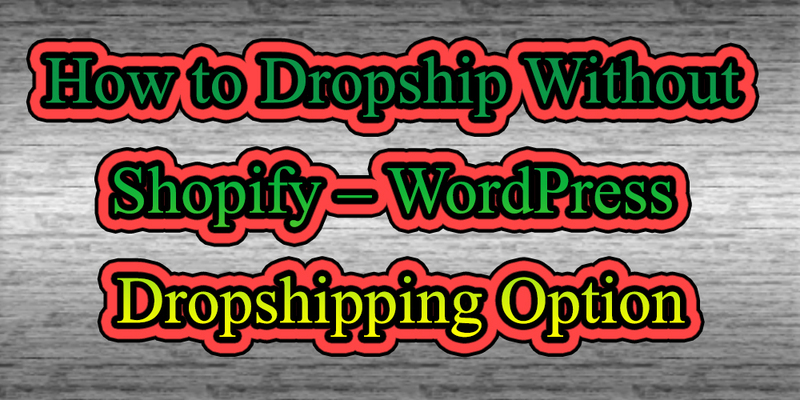 You may not find a Dropshipping plug-in that is compatible with WordPress. So, when you sign up into Shopify you are basically agreeing to some of their Terms and Conditions which you need to abide in any case. You may never break these Terms of Service but part of your store ownership is in the hands of Shopify. When you give part ownership of your store to Shopify it means that you’re the company can close your store any time without any prior notice for any reason. Lots of Shopify owners complain about shutting down of their stores by Shopify for no reason at all. Their store was generating good monthly income and it was closed down just like that. So, this is one of the biggest drawbacks of having a store on Shopify. It might not be a big deal for a few people as they are already paying monthly fees for different software however the basic plan of Shopify sign-up starts at $29 per month. They also have some additional fees like credit card fees, transaction charges and other charges. Talking about Oberlo app, it has a free starter plan but charges a monthly fee. You are also capped at 500 products per month. Additionally, Oberlo only fulfils 50 orders on monthly basis automatically. You get 10000 products when you move up to the basic plan but you are still capped at 500 products per month. So, you are basically paying around $60 for the maintenance of your Dropshipping store on both Shopify and Oberlo. It is not easy to pay so much for maintaining your store when you are a beginner. You need good advertising and promotion of your Dropshipping store. Dropshippers mostly use Facebook ads and Instagram shout outs to promote their store. So, most of your money should be utilised in your marketing instead of website maintenance as the marketing is the most crucial aspect of any online business. Say you if you $60 a month you must it utilize it in marketing. Marketing will benefit you in your sales. One of the best alternatives plug in for Dropshipping is AliDropship. This plug in basically turns your WordPress website into a full-fledged functioning Ali Express Dropshipping business when you install it on your WordPress Installation. Two main reasons behind suggesting this plug in is that you don’t have to give away part ownership of your store to anyone. You are solely the 100 percent owner of your own store as you are using WordPress. Also, AliDropship doesn’t charge you anything on monthly basis which means you only have to buy it once and you hold its complete ownership. AliDropship also offers great features similar to Oberlo. Search and Import let you utilize coordinated channels to locate your ideal items on AliExpress.com and afterward effectively add them to your site. Auto Updating is an auto refreshing framework keeps your item data reliable with to-the-minute information from AliExpress. Estimating Automation utilize propelled evaluating mark-up equation to rapidly apply valuing guidelines to any things in your store. Fulfil Orders Automatically makes requesting each item physically simple. Simply tap the order button and rapidly affirm your request on AliExpress. ePacket Shipping Filter Offer your clients quick and free conveyance with our ePacket shipping choice that makes discovering items a breeze. Auto Order Tracking checks your requests for following updates and sends email notices to your customers naturally. You also don’t get capped on a particular number of products. You can import unlimited number of products. Another benefit of using Ali Dropship is that if you are WordPress user and you prefer to use WooCommerce as your ecommerce platform, the WordPress will give you WooCommerce compatible version of plug in named as AliDropship Woo. This plug-in has a few different features than AliDropship but one of biggest benefit of using it is that you can make use of any WooCommerce store theme you want to and your plug in will work anyway. However, for default AliDropship plug in you are only bound to use three themes which work pretty well but if you just want to have more options then you can use WooCommerce version of the plug-in which gives exactly the same thing. You can then use any WooCommerce store theme that you want to. Another great feature that it offers a custom store creation. If you are someone who is not into technical or creative stuff then it will benefit you. It will only cost you one-time fee for whatever package you chose. You get all the benefits without paying any monthly fees. They also take care of all the technical stuff for your website. For example, they will register a domain name for you, select your niche in case you can’t decide what to exactly sell, they will do on site SEO and will create different social media pages for your website including the graphics and the promo video for your store. The promo video is a part of the ultimate package. The best thing about it is that you also get a personal manager who guides you through your journey of building your store. The personal manager will answer all your doubts and questions. So, if you don’t want to deal with Shopify, AliDropship and WordPress are great alternatives for you.